This particular post could really be applied to how anyone can hear from God but the list is expanded and most Christians won’t necessarily hear from God using all of these methods/channels of communication. I’ll spend the most time expounding on the first one because it is mandatory for anyone who flows in the gift of prophecy. Otherwise, you may find yourself into a situation where one day you find out you weren’t talking to God after all. How then would the prophet be equipped to give the prophetic word if he/she has not read the entire bible? If the prophet reads verses here and there or a few books of the bible it means they don’t have the full picture. Is this the person you would want to give you direction for your destiny and future? Start with a version that’s easier to understand like the New International Version (NIV). Download a bible app on your phone biblegateway.com you can listen to the bible. A chapter or two per day is not hard to do. Do it at night before you go to sleep. This will help it to get into your spirit. Don’t read all the prophets together. It’s very heavy stuff so you can break it up with other books in the bible. If you don’t, it will be very difficult to read back to back because it is so heavy. I wish someone told me this the first time. The 2nd time you read the bible choose another version. This is good because you’ll see things you didn’t see the first time you read it. Then a few versions down the road try just listening to the audio bible. This is quite fascinating because you will hear the scriptures used in context and get a better idea of the environment and what was going on when they were written. Reading the bible more than once is like peeling off the layers of an onion. The more you read is the more you see and hear. And as you peel the layers off the bible it’s like applying the layers to your soul and spirit. What I mean is, it act as a protective shield. Which means you will be able to catch things that are not correct very quickly. You may not know the chapter and the verse but you’ll know you read it. And, with a simple word search you’ll be able to find it. Do you know that check in your spirit that you get sometimes when you listen to some a prophetic words or a preacher? You get these for one of two reasons (1) what they are saying is false. Which means you need to go and check what they said with your bible. (2) if you checked it and it is actually biblical then it means you’ve identified a stronghold in your life. Yes, a stronghold will give you a check in your spirit because God’s word will exposed something within you that is not aligned with Him. What you need to do in this case is ask God for the grace to accept His word. He won’t change His word so the one who needs changing is you. With prayer you will be able to accept and start living out His word. Please note*** a check in your spirit that goes against your doctrinal beliefs and one that go against the bible is not the same thing. Your church doctrine is man made, the bible is God breath. This is not same thing. For example, you can choose not to believe in miracles because your doctrine/denomination says miracles are not for today. However, the bible is full of miracles so we know that it is biblical. Most people think their doctrine and the bible is the same thing and it is not. 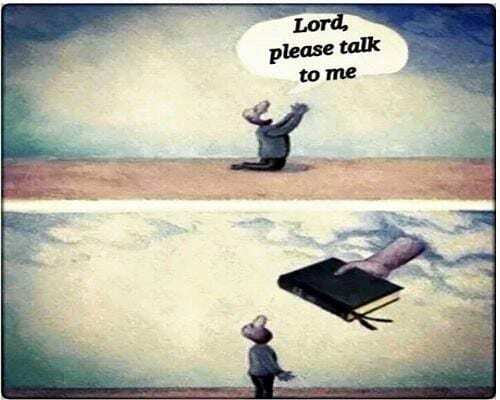 If you can decipher the difference between these two, you will be well on your way to discerning when God is talking to you. One other important point about the bible is that it is a part of the Armor of God. This is our armor that we use in spiritual warfare. The belt of truth is the word of God around your waist and the sword of the Spirit is the spoken word of God in your mouth. If you don’t have the complete word of God within you then your Armor is not complete. You are missing 2 pieces. Now initially we can get scriptures to defend ourselves in a specific area but as we mature in the spirit, we are supposed to be more equipped. Your father will buckle your seat belt when you are 2 years old but when you are 20, you need to do it for yourself. God protects us until we get to a certain age from some things then we are expected to grow up, stop drinking milk and start eating solid food (Hebrews 5:12-14). The rest of these on the list must always be used in conjunction with the bible. There is a lot of things in the supernatural and operating in the gifts of the Spirit that is mimicked and copied by the new age movement and other religions. You can easily fall into falsehood if the rest of these aren’t working in tandem with the word of God (it is scripture based). Remember the enemy is a master counterfeiter. He’s likes to copy. 2) Getting in the Presence of God/The Secret Place. I don’t believe anyone can hear God clearly as a prophet if they are not spending time alone with the Lord. You need the quiet time. You need the intimacy. It is in the Secret Place where you’ll get the prophetic download. All the prophets in the bible spent time in the presence of the Lord. Many other religions do chants and other rituals to get into the presence of their gods so we did an entire series on how you can do this the correct way and you can read it here. You cannot be a mouthpiece/spokesman for God (which is what a prophet is) if you don’t spend time in His presence. 3) Prayer. I don’t think you can separate the prophetic gift from prayer. Prayer is communicating with God so this is how you would get the word. Actually the bible never refers to intercession as a spiritual gift. And, as I said in the first post of this series, intercession is a gateway gift. That’s why it’s called prophetic intercession…because if you are an intercessor there’s a 99.9% possibility you have the gift of prophecy. 4.) Dreams. We know the Joseph was a dreamer and so was Daniel so God speaks to us through dreams. They happen when we are asleep. But dreams actually have 3 sources – God, the enemy, or your own soul (your fears or desires). When God speaks to you audibly it is very clear but dreams need to be interpreted and there is a learning curve to get the correct interpretation. It could take months for you to figure out some of the symbolism. Let’s face it very few people are literal dreamers. 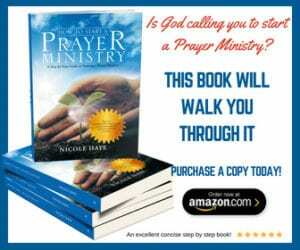 If you are a dreamer, pray to God for the interpretation, read any scriptures that come to mind from the dream and then purchase books from other Christians on dream interpretation. Most of the resources online for dream interpretation are new age so you need to make sure the source for the interpretation is Christian. Bottom line here is that these prophets were telling dreams from their own soulish imagination and God was saying you don’t need to listen to this get my words, directly from Me (the bible), because it is like fire and a sledgehammer and will demolish everything. There is no higher authority than His word. Dreams apart from His word could come from a source that is not Him. 5.) The Audible Voice of God. This is not just for days of old. God still speaks to His people in an audible voice. 6.) God Speaks into your spirit. When you have the Holy Spirit He can speak directly with you in your spirit. That is that area just below your rib cage and above your stomach. Some people call it their “knower” they know something and they don’t know how they know it but they do. 7.) Visions. There are open visions which happen with your eyes opened and you see images over what you are looking at in the natural. Closed visions happen when your eyes are closed but you are fully awake. They are usually in the form of pictures or they can be played out like a movie. 8.) Trance. These are like dreams except you are awake and your mind is taken into another place where you are able to see things and interact with them as well. 9.) Through other people. They don’t need to be saved or even know they are being used by God to speak to you. If your spirit is in tune with the Holy Spirit someone could be having a conversation with you on one topic and you are receiving a message related to something completely different from God. 10.) Numbers. Series of numbers 11:11, 1:11, 2:22, 333, 444, 555, etc. If you keep seeing the same series of numbers over and over again God is actually try to tell you something. The truth is these numbers mean different things for different people and you need to find your own interpretation for these numbers as it relates to each situation. You do this by praying and asking God to show you the meaning of them. Now if you are living your life by numbers, you won’t do anything till the 7th time or it has to happen in 3 or it isn’t God it won’t be long before the devil starts fooling you with the numbers. The numbers in themselves shouldn’t be your signal to move ahead or not. Otherwise you will fall into numerology or gematria, which is new age. They help to confirm things but they shouldn’t be used to make decisions by themselves. The best way to handle numbers is to tie them back to a scripture. So if you keep getting 11:11 then look up every chapter and verse in the bible that has 11:11 and see which one speaks to you. Also, pray and ask God what it means specifically for you. More often than not I find the numbers mean different things for different people. That’s a list of 10 for you! 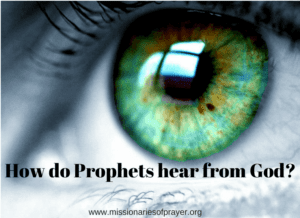 This is not the only way that God speaks to his prophets but He definitely uses some of these. If you don’t have some of these as His way of communicating with you, don’t worry about it. Once you master one area He will open you up to others. This is a biblical principles, Read the Parable of the Talents (Matthew 25:14-30) the one who has more will get more still and the one who has less even that which he has will be taken away from him. This may sound unfair to you but the truth is if God has a way of communicating with you and you refuse to use it, then He won’t open another way to you. Instead the one that faithfully stewards that communication will receive more. If you have other ways in which God communicates with you, please share below! We would love to hear from you. Next Wednesday we will talk about how to identify if you have the gift of prophecy and ways you can start and using it. God Bless! Do you have any personal recommendations for Christian Dream Interpretation books? I had a situation in which someone gave me specific instructions on how to read the Bible. This was for a specific purpose and I’m certain God sent them to give me instructions and guide me but I was told to close my eyes, open my Bible, and read where I had opened it at. It was beyond remarkable how each chapter was directly related to the situation I was/am in. Since then I have tried to read through a book and I can’t focus on it but I consistently get answers by opening to a “random” page/chapter. If there is something God wants you to know or share, He will direct you to it in remarkable ways. The important thing is to read it and to be open to what it is saying to you, whether you like what it is revealing or not. And I COMPLETELY agree, too much focus on the prophet’s books can be extreme. It can definitely turn you into an alarmist (been there, done that). Awesome series. It is an amazing thing to hear Him speak to you. I can’t say there is a right or a wrong way to do it. I can only speak from personal experience of reading it for the first time. What I learnt was that I shouldn’t have read all the prophets together. It was just too much for me. Since the Gospels are the same stories from a different disciple those could be used to break up the prophets as well. I left the book of Revelation for last, even after reading the old testament, and this really helped me to understand Revelation much better. I think reading at least one of the Gospels (Matthew, Mark, Luke and John) followed by the book of Acts and then the other books in the New Testament is good because it shows continuity of the scriptures. Likewise, reading Genesis through to Isaiah can be read together to see continuity. Ruth can be read breaking up one of the Prophets because it can stand alone, 1 & 2 Kings and 1 & 2 Chronicles are also similar just told from a North and South perspective so these two (Kings & Chronicles) can be used to break up the prophets. I think just diving in and reading it from cover to cover is the most important thing.